Samsung's 2016 flagship represents the company's best effort in the fight for smartphone dominance. This beautifully crafted phone stands tall among its competitors, and justly so. Samsung packed a lot of capability into an easy-to-use, attractive handset that claims to have it all. 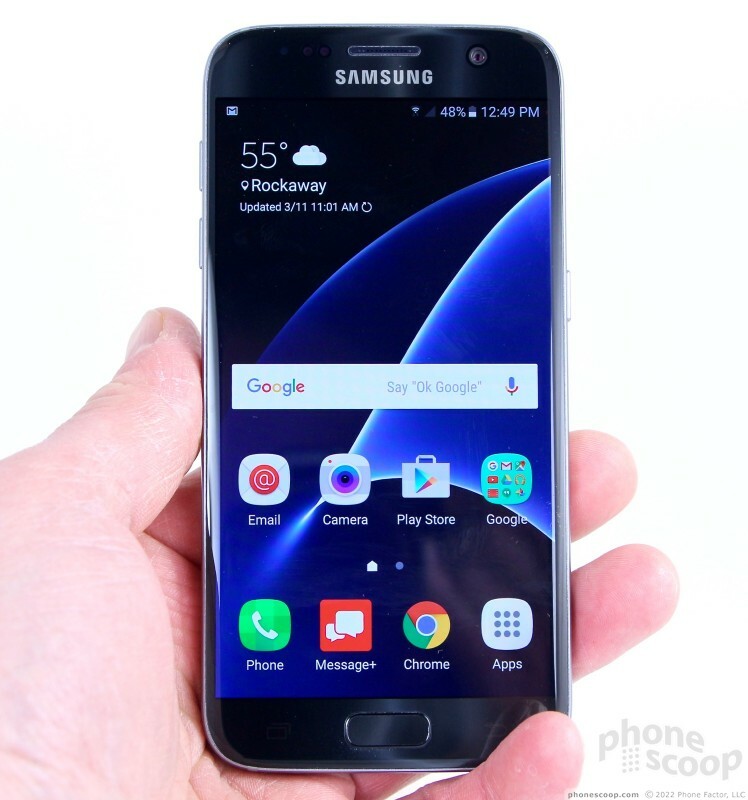 Here is Phonescoop's in-depth review of the Galaxy S7. The Samsung Galaxy S7 is for those seeking the finest Android handset money can buy — and nothing less. This phone represents the pinnacle of hardware design, engineering, and manufacturing from the company often considered to be Apple's most formidable rival. As long as you don't mind spending a pretty penny, the Galaxy S7 delivers refined performance across the board. The Galaxy S7 and its brother, the S7 Edge, are works of art disguised as pieces of technology. They represent Samsung at its best. The S7 and GS7 Edge are not perfect, but they're getting close. Samsung's flagship phones made a big jump between 2014 and 2015 when the company ditched plastic in favor of metal and glass. The improvement in quality was enormous. 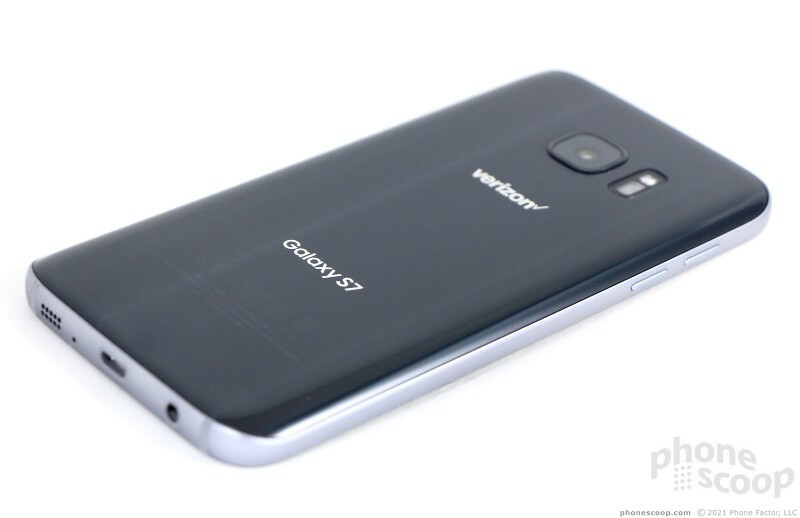 Samsung largely recycled the S6's design for the S7, but smoothed out all the rough spots. For example, the glass face now has curved edges to meet the frame of the phone, giving it a more rounded look and feel. The joints between glass and aluminum are more seamless all the way around. 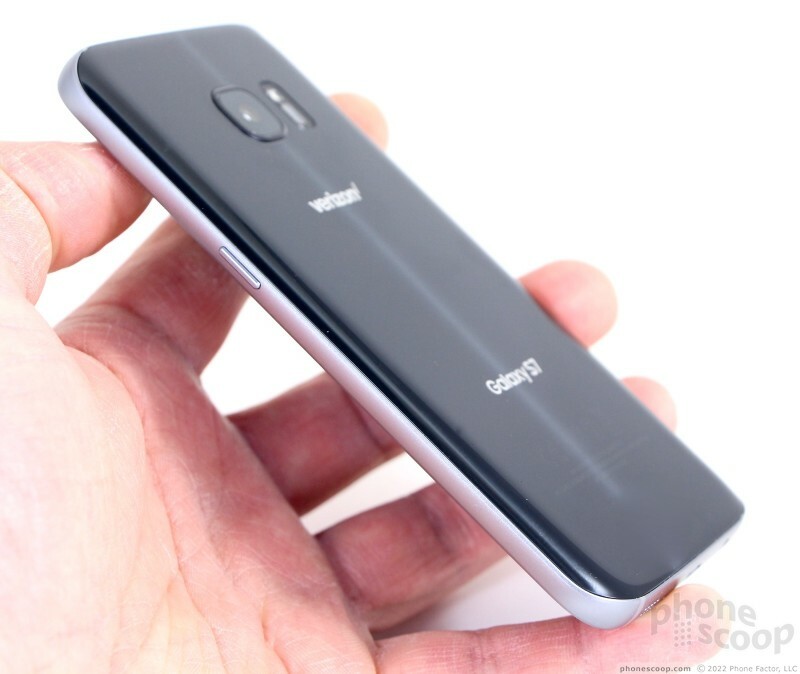 The metal frame is rather thick along the bottom and top edges, and is somewhat thinner as it runs up the sides; the rear glass bends and curves accordingly. The S7 feels like a more complete device, as though it were designed by a single person with a clear vision rather than a team or committee. The S7 is surprisingly compact, all things considered. Its chief competitors in the metal-and-glass category are the iPhone 6s and HTC One A9 (although the latter is not quite a flagship). The S7 has a bigger screen than both the 6s and A9, but its overall footprint falls in between the two; it's smaller than the A9 and larger than the 6s. It is the heaviest and thickest of these three phones at 7.9mm and 5.36 ounces. Even so, I found the S7 very comfortable to use one-handed and believe most people will enjoy the size and shape of the S7. Samsung used top-notch materials to assemble the S7. The aluminum frame is strong, and the glass panels are fitted into the frame precisely. You simply can't ask for a more refined and thoughtfully crafted handset. Samsung was sure to assemble the S7 as tightly as possible. It's a dense piece of hardware, and you can tell by its heft. The phone slips into pockets with ease, and is just as easy to retrieve. It is mostly glass, though, so if you drop the S7 onto a hard surface, well, good luck with that. Some may feel compelled to protect the S7 with a case, which of course detracts from its aesthetic appeal. 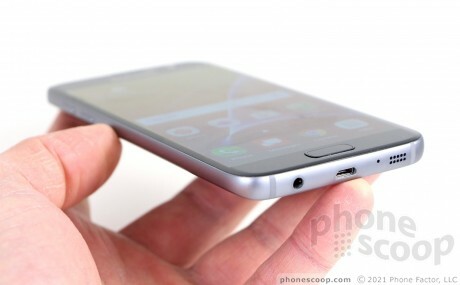 The phone's front face is classic Samsung and in lockstep with the company's recent designs. The metal frame has a matte finish that I prefer to chrome. The glass on our review unit is black onyx, but the phone also comes in gold, silver, and white. A color-matched grille covers the earpiece speaker. 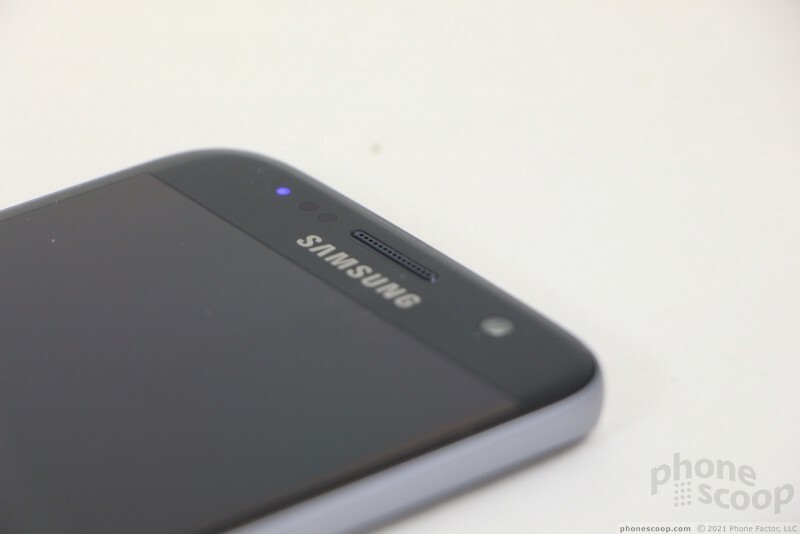 Several sensors and the user facing camera are plainly visible, even on the black model. 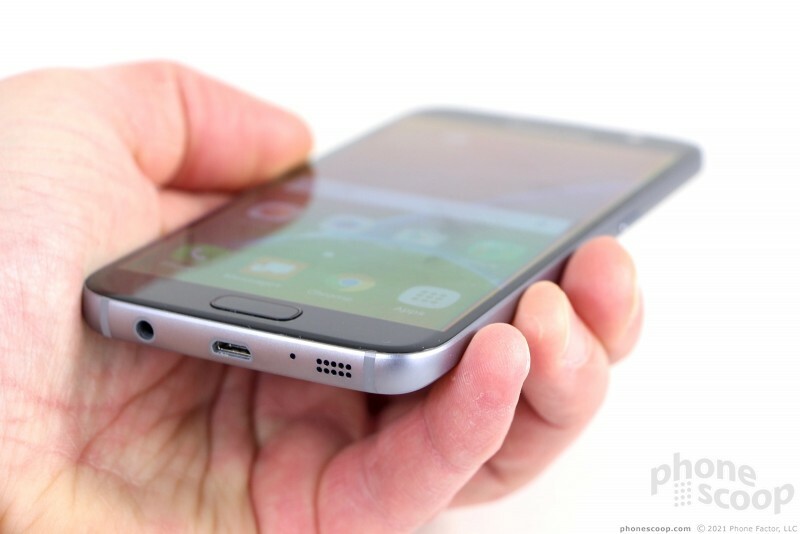 An oval-shaped home button (that doubles as the fingerprint sensor) rests below the display. It has a raised profile to make it easier to find and use. Unlike previous designs, the button's rim is not chrome and instead blends in with the black onyx glass. Travel and feedback are excellent. Two capacitive controls sit on either side of the home button, with multitasking on the left and back on the right. The capacitive buttons work fine, though the placement is counter-intuitive (the back button would make more sense on the left.) 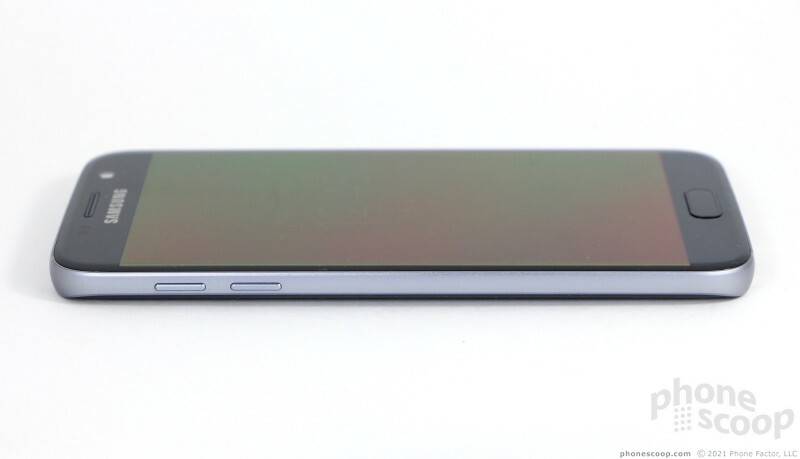 The 5.1-inch display fills the bulk of the phone's face. 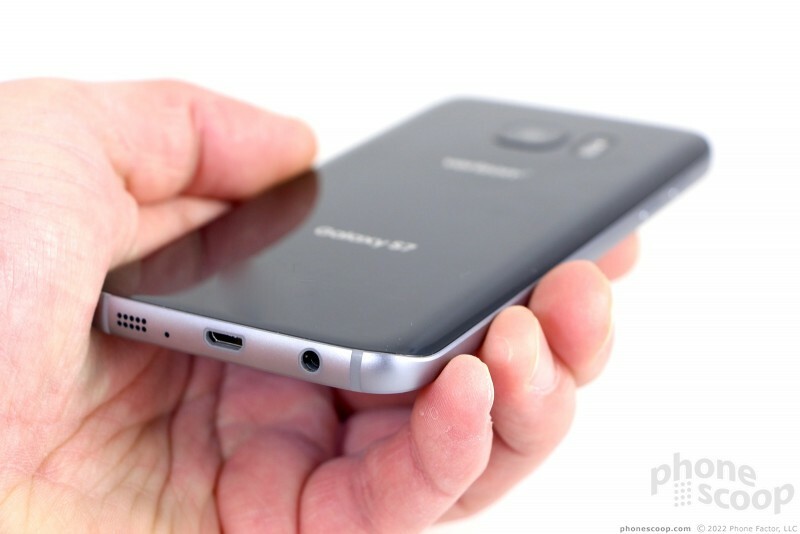 Samsung placed the volume buttons on the left side of the phone. They are positioned close to the top edge. Samsung nailed the profiles, action, and feedback of these keys. I really like these buttons. 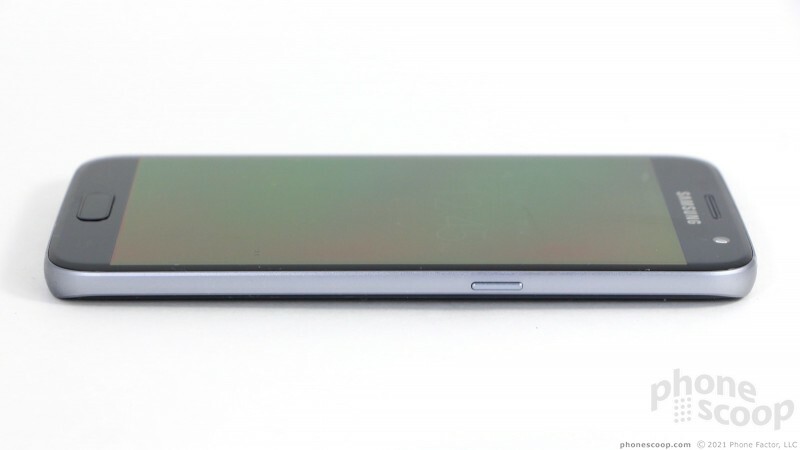 The screen lock button is positioned closer to the middle of the right edge. It's well-placed, easy to find, and pleasing to use. You'll find no chintzy components here. The combo SIM/memory card tray is buried in the S7's top edge. Samsung is offering only a 32 GB variant of the S7 to US consumers, but the memory card slot supports microSD cards up to 200 GB. The tray is a little janky. It's plastic, not metal, and it takes some coordination to properly inside it with a SIM card and memory card. 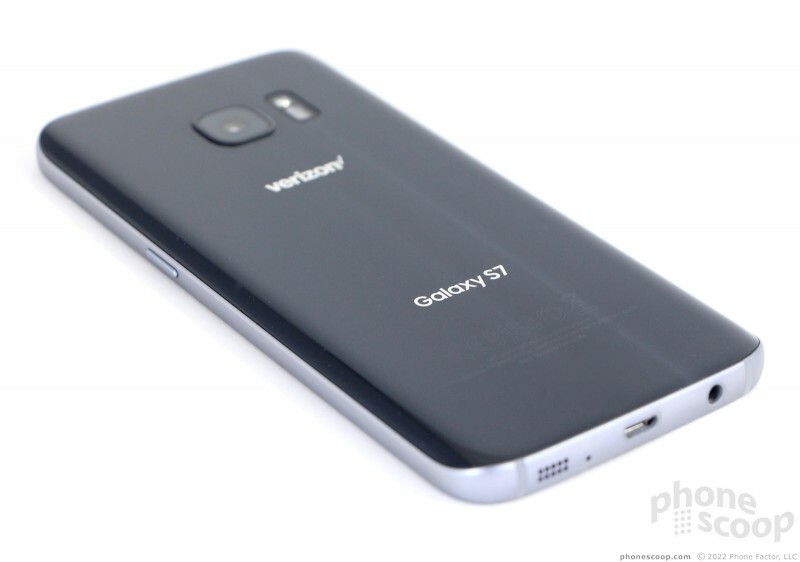 (Bringing back the memory card slot rights one of the wrongs Samsung made with the GS6.) 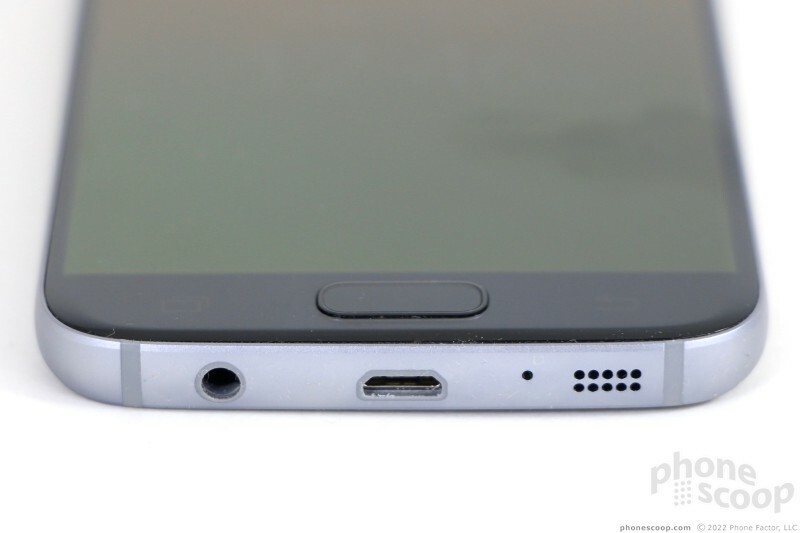 Like last year's Galaxy S, the bottom of the phone is a busy place: it holds the headphone jack, micro USB port, microphone, and speaker. Everything looks precisely machined and works as intended/expected. Since it's made of glass, the S7's rear panel cannot be removed. That means, too, that the battery is sealed tightly inside. 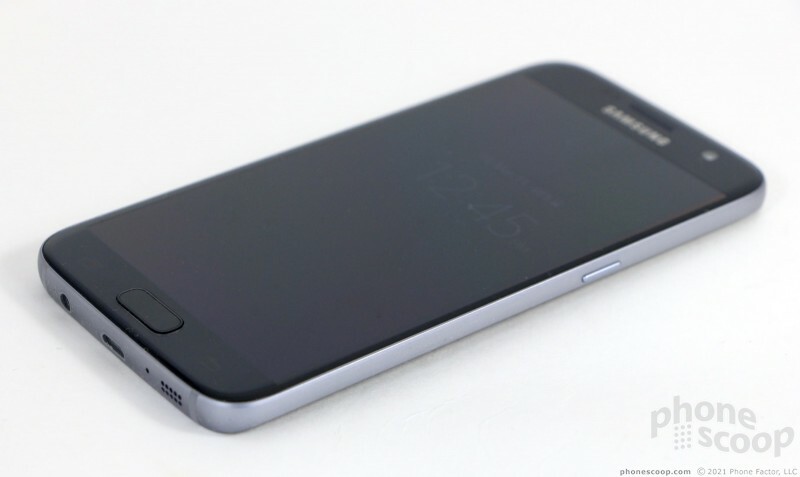 The S7 is slightly thicker than the S6. This helps it do a few things, one of which is to bury the camera module deeper into the body. The S7's camera module has a rim that sits just a little bit above the surface of the rear panel. The S6's camera module protruded much more. 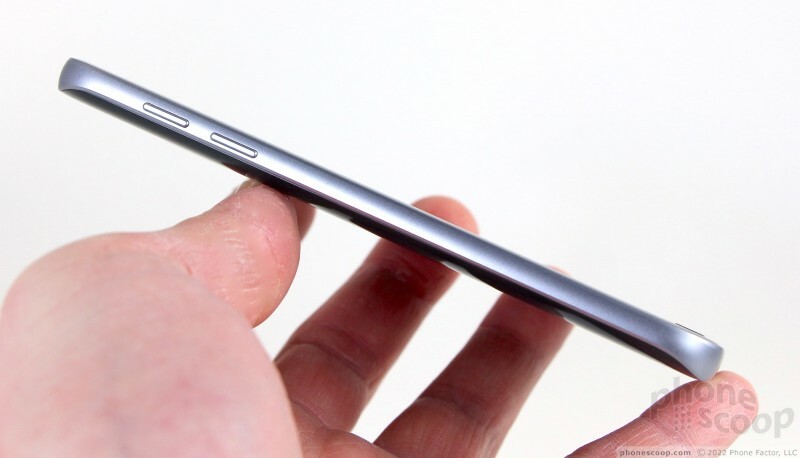 We've gained a more seamless rear surface and larger battery at the expense of a thicker phone. 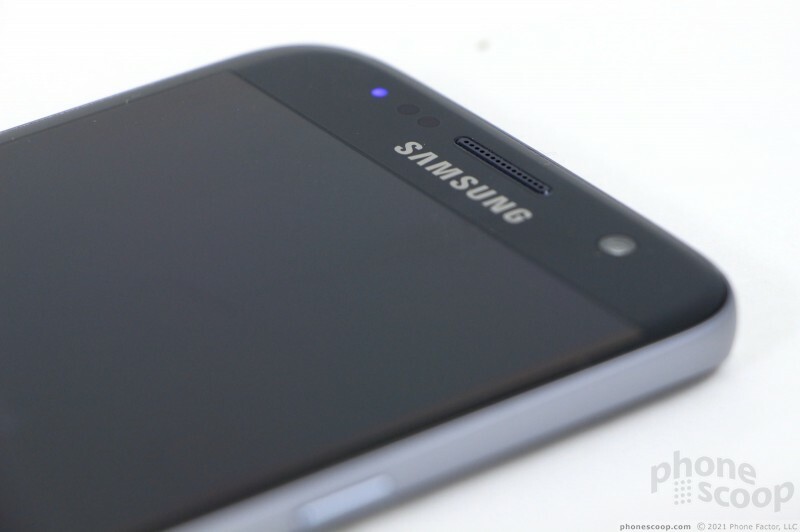 The S7 keeps the LED flash and heart rate monitor close to the camera. 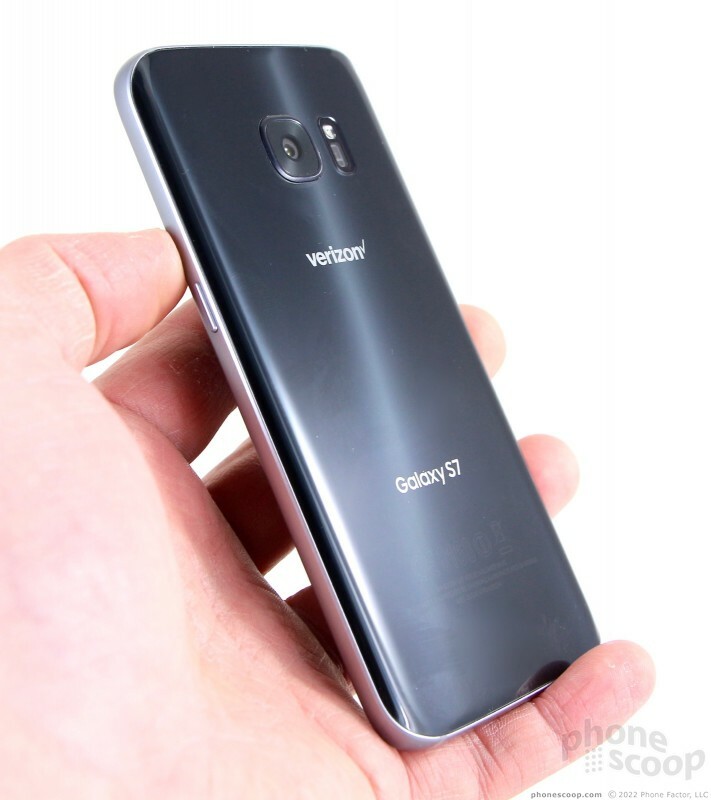 The only other design elements on the back are the Verizon logo and Galaxy S7 branding, painted in shiny chrome. Did I mention that the S7 is water resistant? It is. In fact, it can sit in 1.5 meters of water for 30 minutes and emerge unscathed. This is a big deal. So many people drop their phones in the toilet (gross), pool, or sink and ruin it. The S7 is slim, attractive, waterproof and doesn't have any ugly hatches protecting the ports. Samsung's engineering team did a great job. This is another reason the S7 is a bit thicker — the extra girth helps the interior accommodate the needed elements to prevent water from seeping in. I tested the S7 in the shower, in the sink, and even dropped it in my morning cereal. The phone is as waterproof as the bulky rugged phones made by the likes of Kyocera, CAT, and Sonim. That's impressive. The Galaxy S7 is a state-of-the-art handset in every sense. I'm smitten. You will be, too. Samsung somehow crammed a quad HD screen into the S7's tight, 5.1-inch frame. 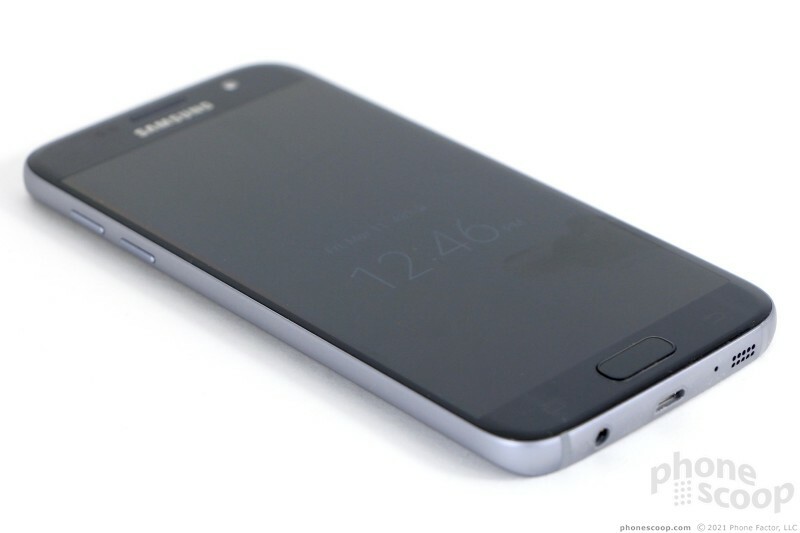 Samsung favors Super AMOLED displays, and the S7's is lovely. The resolution density is about as high as it gets, with 3.67 million pixels adorning the display at 576ppi. The S7 is one of the sharpest displays available. I found it to be nice and bright, without the overly garish color representation that's typical of Samsung phones. That means it's more accurate. I didn't have any trouble using it outside, but viewing angles weren't as good as I was expecting. Still, overall, no complaints. You probably don't need a quad-HD display in your phone for normal use, but it makes a big difference for VR. 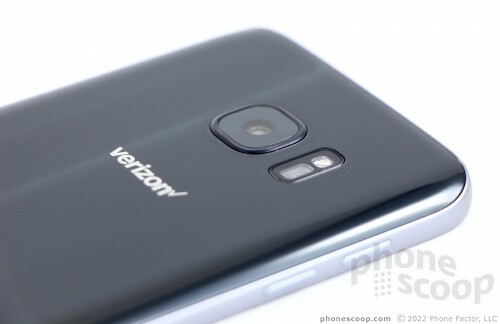 The S7 of course runs on Verizon's LTE network. Tested around the NYC metro area, it performed on par with other Verizon devices but it didn't bowl me over. Calls connected on the first dial without fail and the phone didn't drop any calls, even in a moving car. However, the S7 did miss a few calls that went straight to voicemail. I was able to connect calls in all coverage conditions, weak and strong. On the data side of the equation, the S7 was quick to download apps, load web pages, and scroll through image-heavy apps such as Facebook and Instagram. I've seen faster peak download speeds from other devices, but I can't rule out that I ran into network/location issues, rather than a problem with the S7. My guess is most people will be pleased with the S7's performance. Voice calls sound great via the Verizon S7. I was very pleased with the phone as far as its actual phone functions are concerned. Voices in the earpiece were plenty loud, enough so to overcome most typical spaces in which you might find yourself (home, office, car). Voices sounded clear to my ears. There was no distortion or breakup, even when the volume was set up all the way. I wish calls sounded a bit warmer, but volume and clarity are more important than timbre. Those I spoke to through the S7 said I was loud and clear. The speakerphone maintains a good volume level, and clarity drops just a little bit. I was able to hear calls via speakerphone in the car, outdoors, in my home, and so on. The speakerphone was a bit more prone to distortion than the earpiece, but not overly so. Ringers and alerts reach klaxon levels and will jolt you from the deepest slumber. The vibrate alert is just barely good enough. Another reason the S7 is thicker than the S6 is to accommodate the larger battery. Samsung increased the power source from 2,600 mAh to 3,000 mAh. The difference is palpable. Where the S6 just barely eked out a full day of use — and sometimes didn't — the S7 is more consistently able to provide usable uptime between breakfast and bedtime. I was not able to drain the battery fully, not once, despite repeated attempts over several days of testing. I was sure to stream YouTube videos, stream Pandora playlists, browse the web, page through Instagram, and spend plenty of time perusing Facebook. The S7 managed to end each day with at least 20% left, if not more. That's good news. 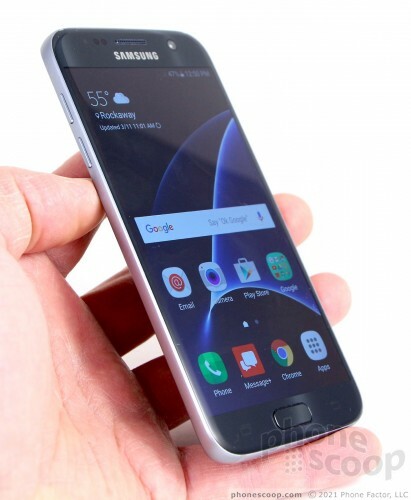 The S7 includes the typical set of Samsung power management tools. Samsung's Power Saver mode and Ultra Power Saver mode each offer distinct benefits. The former tones down the screens, notifications, and the processor to drum up a bit more life from the battery. The latter puts the phone into ultra basics mode with a greyscale screen and severely limits apps to push through hours of basic communications. The S7 supports Quick Charge 3.0 and rapid wireless charging. When plugged into the included charger, I found the S7 charged from 20% to 100% in 90 minutes. Wireless charging took a bit longer at 2.5 hours, but that's still pretty good. Samsung was sure to endow the S7 with the usual set of radios for secondary communications. 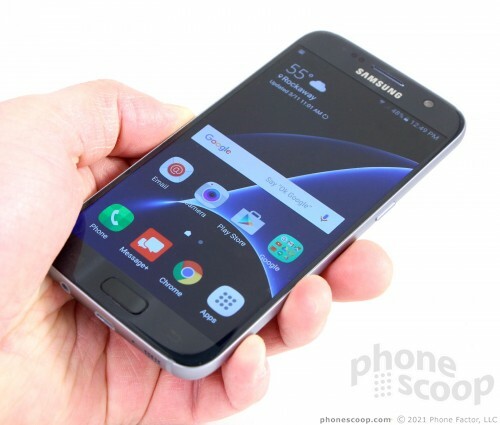 The S7 supports Bluetooth 4.2 and the typical set of profiles for connecting to accessories, computers, and vehicles. The phone pairs easily with everything. Phone calls sent to mono headsets and my car's hands-free system were very good. I was impressed with the clarity of calls through a headset, in particular. Music pushed to my favorite Bluetooth speaker was also very good, but I've heard better. The S7's NFC radio was instrumental in helping pair the device with several of these Bluetooth accessories. In other words, it works as intended. The NFC radio may also be used with Android Pay, which is preloaded on the phone, and Samsung Pay, which is available as a separate download from the Google Play Store. Google Maps pinpointed my location on the S7 faster than it has with any other device. We're talking 2 or 3 seconds. Accuracy was down to 20 feet, which is about as good as it gets. Not only is the S7 quick and accurate with respect to location, but it worked flawlessly with Google Maps to serve as a powerful navigation tool. The WiFi radio was impressively quick. Samsung and The Weather Channel have created an exclusive weather app only for owners of Galaxy-branded smartphones. The Weather Channel App for Samsung offers features the regular Weather Channel app does not include. Verizon Wireless has made a Galaxy S7 and S7 Edge buy-one, get-one deal of its own available to smartphone shoppers. Beginning today, customers who buy one Galaxy S7 or S7 Edge can receive a second one for free as long as the second one is activated on a new line.